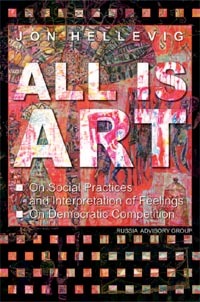 From time to time I want to draw attention to one or another book or publication of importance. 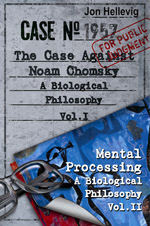 I announce my new books The Case Against Noam Chomsky and Mental Processing (May 2010). These are volume one and two of the series A Biological Philosophy and are published together in one cover. The books are about philosophy, cognitive psychology, and linguistics. I am very much influenced by Franz Kafka. I consider that I have to a great extent interpreted the same feelings that Kafka wrote about. Kafka is timeless. Kafka can be read anytime by anybody. In the same way that we can look at a piece of art many times over again, we can also read Kafka’s book again and again. 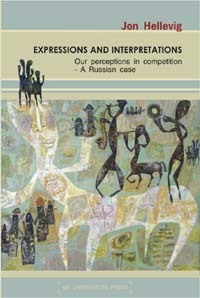 – As a good aid to understanding Kafka, and also as a book on its own right, I recommend Roberto Calasso’s book on Kafka: K.
For me the timeless symbolic language of Kafka expresses the same thoughts that I interpret in my book Expressions and Interpretations.